Step through shader execution with the ability to inspect variable values and update shader code in place. 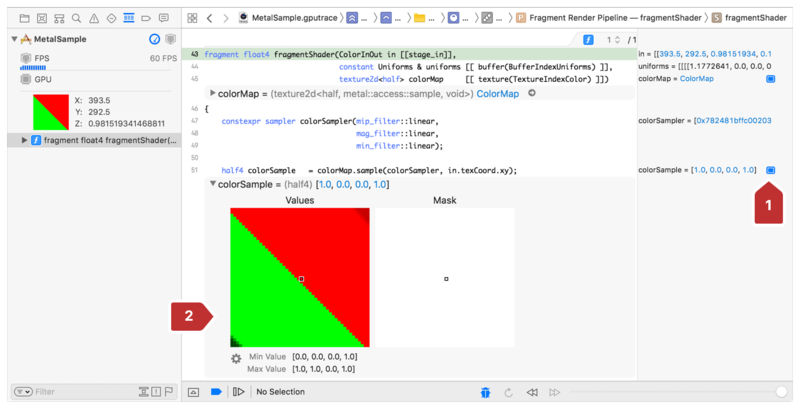 The Metal shader debugger brings common debugger features to your shader development, like stepping through execution, variable inspection, and the ability to edit code and update the results live. The variable views expose issues as they occur by allowing you to visually confirm the results of each statement. Combining that with the ability to step through execution, like loops, can easily show you how well your algorithm is working. With the Update Shaders feature, you can change your shader source code live and quickly see the results of your changes. In Xcode, navigate to your project's build settings. For the Debug build configuration, set "Produce debugging information" to "Yes, include source code." Because App Store apps cannot contain debugging information, set "Produce debugging information" to "No" for the Release build configuration. Use the shader debugger within a captured Metal frame. Most commonly, you capture a Metal frame by clicking the camera button on Xcode's debug bar as covered in Performing a GPU Capture from the Debug Bar. For more ways to capture a Metal frame, see Metal GPU Capture. Unlike with a conventional debugger, you cannot set breakpoints on code running on the GPU (shader conditions), but you can trigger the Metal capture in code running on the CPU (regular app code) using the steps in Performing a GPU Capture from a Breakpoint. Another approach is to capture CPU-run code programmatically using the steps in Performing a GPU Capture Programmatically. Expand your command buffer in the call list. Filter the call list by function name by entering draw in the filter field. Select the draw call that shades the primitive you want to debug. Double-click Geometry to open the geometry viewer. Select a primitive to debug. The vertex function is then shown in Xcode's center pane with the parameter and variable displays populated with the values of the selected primitive. The Region of Interest (ROI), highlighted at left in Figure 4, contains all of the vertex function's statements, and the debugger has its execution playhead set to the function's entry point. Expand the draw call that runs the fragment function you want to debug. Select Attachments for the draw. Click an area inside one of the attachments and pan the mouse to the fragment you want to debug. Optionally, use the arrow keys to move the magnifying glass in single-pixel increments. Click Debug to open the fragment function. 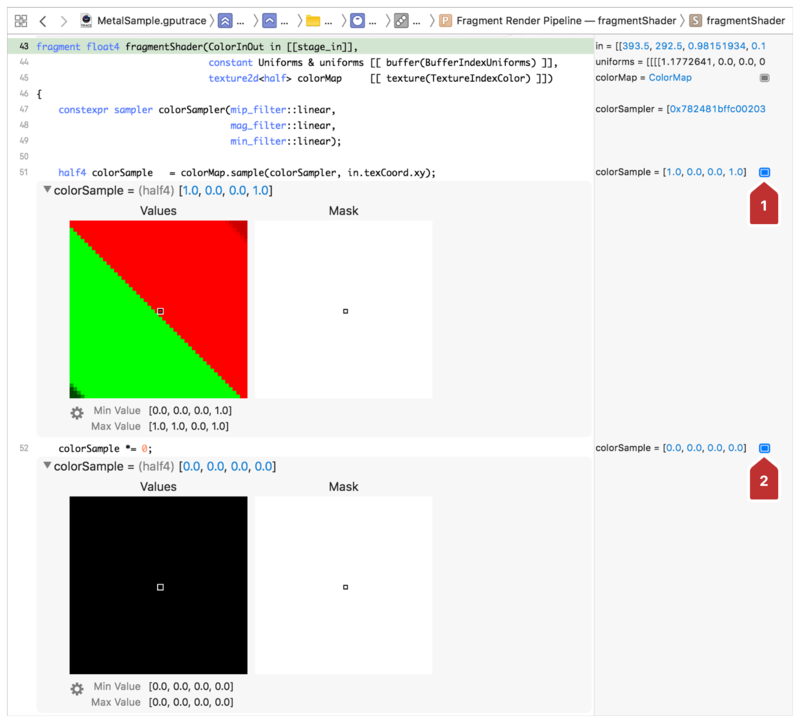 The fragment function is shown in Xcode's center pane as seen in Figure 7. The parameter and variable displays are populated with the values of the selected fragment, at right in Figure 7. Click to expand the ROI, highlighted at left, to list the fragment function's statements. In the center pane, observe the debugger's execution playhead set to the function's entry point. Select a statement in the ROI list. The execution playhead moves to the corresponding line in Xcode's center pane. A statement's source code must be present in the file to support stepping in, as illustrated with the float3x3 function in . Unlike a conventional debugger, the shader debugger allows you to step backward in execution or even select an arbitrary statement. Changing the location of the execution playhead can affect the values of variables displayed onscreen because they represent the state of the frame's data at that point in time. This is particularly helpful when stepping through loop iterations in shader source code. Click the gray block to the right of a variable at right in Figure 9. See the variable inspection panel shown below the corresponding statement in the shader source code view. You can expand nested properties in the variable inspection panel, as seen in Figure 10. Nested properties of the uniforms argument are displayed: the columns of both the projectionMatrix and modelViewMatrix. Expand a color sample to see its texture. Expand the variables view for the color sample's next modification to see how it's changed. The numeric values [0, 0, 0, 0] are a clear indication that you have a blank color sample, but the visualization of variable textures can be helpful in cases where the numeric data isn't as immediately telling of the cause of an issue. After making a change to a shader you can apply the update live using the Update Shaders button highlighted in Figure 12. Updates variable views to show their new values. Redraws Attachments in the Assistant Editor. 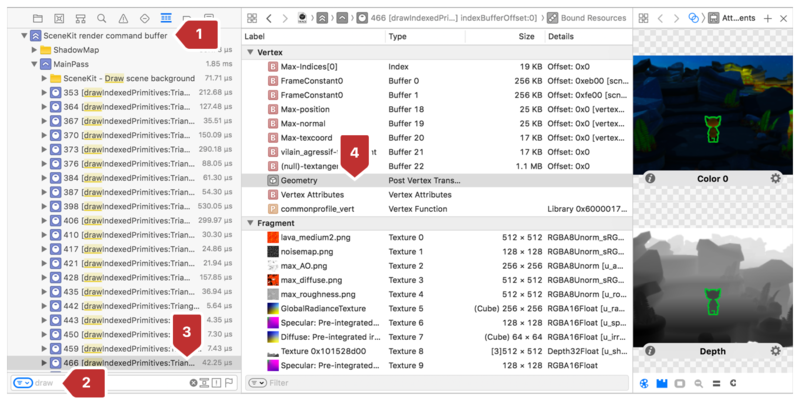 Because Updating Shaders maintains your place in the captured Metal frame, you can easily make successive changes to shader source code for either debugging or development purposes. 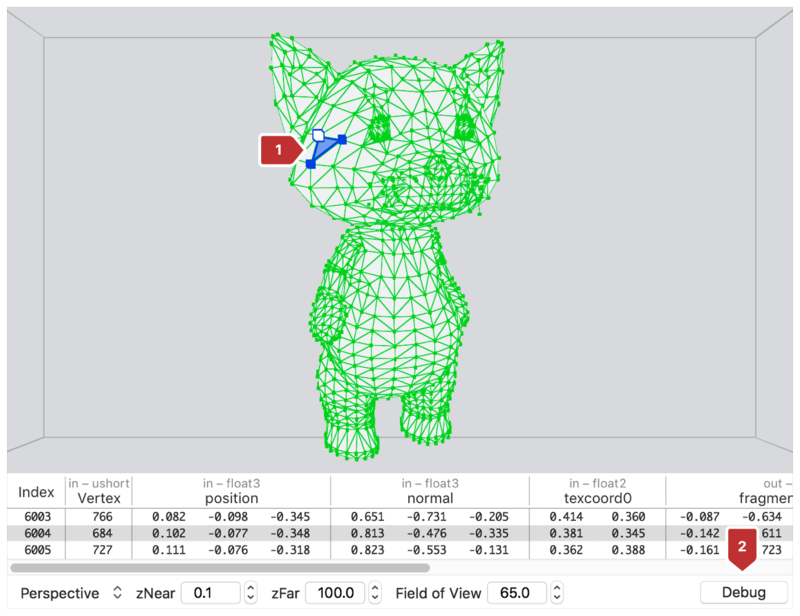 Find problems with geometry by navigating a free-fly camera outside of your camera's frustum and checking vertex values.